The former News of the World editors Rebekah Brooks and Andy Coulson, alongside former senior reporter James Weatherup, former managing editor Stuart Kuttner, and former news editor Ian Edmondson, lost a last-ditch attempt to block their prosecution over alleged phone hacking today. The five defendants tried to get their case dismissed at the Court of Appeal. But Lord Chief Justice Lord Judge dismissed their appeals today. All five are due to stand trial in September. Five defendants including former News International chief executive Rebekah Brooks and ex-News of the World (NOTW) editor Andy Coulson today lost a last-ditch bid at the Court of Appeal to block their prosecution over alleged phone hacking. Former News International chief executive Rebekah Brooks, 44, from Churchill, Oxfordshire, also appeared at the Old Bailey charged with conspiracy to commit misconduct in a public office. The matter was adjourned until next month. Sun chief reporter John Kay, 69, from north-west London, entered a not guilty plea to conspiracy to commit misconduct in public office. The cases have been brought as part of Operation Elveden, Scotland Yard's investigation into alleged inappropriate payments and information leaks. In a separate case, a former police officer pleaded guilty to misconduct in public office. And in another matter, a public official admitted misconduct in public office. Former government spin doctor Andy Coulson appeared in court to face charges over an alleged conspiracy to bribe public officials for information. Coulson, 45, is accused with ex-News of the World (NOTW) royal correspondent Clive Goodman of requesting and authorising payments to public officials in exchange for information, including a royal phone directory known as the "Green Book". Former NOTW editor Coulson, from Kent, and Goodman, 55, from Surrey, face two counts of conspiracy to commit misconduct in a public office - one between August 31 2002 and January 31 2003, and the other between January 31 and June 3 2005. Wearing a grey suit with a white shirt and black tie, Coulson appeared for a short hearing along with Goodman and the case was adjourned until next month. Former Number 10 director of communications Andy Coulson has arrived at the Old Bailey in London. Coulson is due to appear alongside former News International chief executive Rebekah Brooks, former Sun reporter John Kay and former Ministry of Defence employee Bettina Jordan-Barber. All four were arrested as part of the Metropolitan Police's Operation Elveden, an investigation into alleged corrupt payments to public officials. They are due to appear for a plea and case management hearing. The former News International chief executive Rebekah Brooks has arrived at Westminster Magistrates' Court. Both were senior executives at News International and both with ties to the Prime Minister. Now both Rebekah Brooks and Andy Coulson have again discovered they will be charged. Arriving at a police station in South London, Andy Coulson let it be known that he was extremely disappointed and denied these latest allegations, Juliet Bremner reports. The former chief executive of News International has reportedly been given a £7 million pay-off after resigning last year. The Financial Times says the sum was made up of cash and pension payments. It also took into consideration legal fees and her chauffeur-driven car. 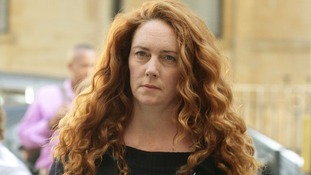 Rebekah Brooks seen last month at the Old Bailey Credit: Press Association. The level of the payment is significantly higher than previous reports of £1.7m. David Cameron's former spin doctor Andy Coulson and ex-News International chief executive Rebekah Brooks will face trial over allegations linked to phone hacking in September next year. The pair appeared at the Old Bailey today with fellow former journalists from defunct tabloid the News of the World (NotW). Ex-managing editor Stuart Kuttner, former news editor Greg Miskiw, former head of news Ian Edmondson, ex-chief reporter Neville Thurlbeck and former reporter James Weatherup are also facing charges, along with private detective Glenn Mulcaire. Kuttner was excused from attending the hearing today. The seven former NotW staff face one general accusation of conspiracy to access voicemails which prosecutors say could affect up to 600 victims, along with other charges related to specific people. Former News International chief executive Rebekah Brooks and David Cameron's ex-spin doctor Andy Coulson arrived at court today, where they face charges linked to an investigation into phone hacking. Five other NotW staff were also present at the Old Bailey.